10mm AAA+ white pink purple Multicolor south sea shell pearl necklace 18"
Length: 18". We will respond within 24-48 hours, in most cases sooner. Q: Can l get my necklace or bracelet in a longer or shorter length?. Price could be different since length changed. Q: Are these real genuine pearls?. Q: You say these are real pearls, why the prices are so low?. Genuine AAA 10mm Multicolor South Sea Akoya Shell Pearl Necklace 18"
Style: NecklaceMaterial: Shell PearlBeads Size:10mmLength:18"Condition: New. Due to the difference between different monitors, the picture may not reflect the actual color of the item. We believe that a good communication will be helpful for solving the problems. 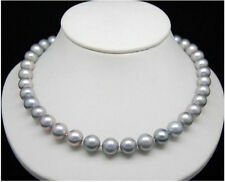 Charming 8mm White/BLUE Shell Pearl Necklace 18" AAA J08. 8MM 18KGP clasp. SHELL PEARL. The luster is 'Superior', the matching 'Excellent', the surface quality is 'Excellent', sea shell pearl, AAA Grade,good quality ,high luster ! South Sea Shell Pearl. (Professional Hand Knotted By Double Silk Threads Between Each Shell Pearls). 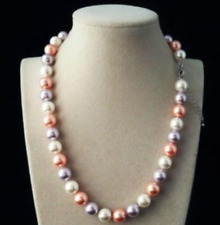 This is a lilac south sea freshwater 18ins pearl necklace with a lobster clasp and extender chain. The beads are 8mm and has an extender chain allowing the necklace to be made longer if required. Main StoneShell Pearl. Main ColorBrown. Size(Approx):8mm. Stringing: Double Knotted Fine Silk Thread The necklace is professionally hand knotted by double silk threads between each pearl. Clasp: SILVER plated. Material: 100% nature pearl, Genuine pearls,not fake or shell pearls. Style: choker. Material: 100% nature pearl, Genuine pearls,not fake or shell pearls. Stringing: Double Knotted Fine Silk Thread The necklace is professionally hand knotted by double silk threads between each pearl. Stringing: Double Knotted Fine Silk Thread The necklace is professionally hand knotted by double silk threads between each pearl. Material: 100% nature pearl, Genuine pearls,not fake or shell pearls. Natural BLACK 8-9mm Rice Freshwater Pearl Necklace 50"
Style: choker. Stringing: Double Knotted Fine Silk Thread The necklace is professionally hand knotted by double silk threads between each pearl. 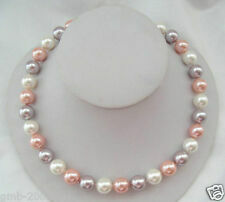 Material: 100% nature pearl, Genuine pearls,not fake or shell pearls. Natural PURPLE 8-9mm Rice Freshwater Pearl Necklace 50"
Style: choker. Main Colour: multicolor. Stringing: Double Knotted Fine Silk Thread The necklace is professionally hand knotted by double silk threads between each pearl. Material: 100% nature pearl, Genuine pearls,not fake or shell pearls. Style: choker. Stringing: Double Knotted Fine Silk Thread The necklace is professionally hand knotted by double silk threads between each shell pearl. Material: shell pearl. shell Pearl Size:8mm. About Pearl. Style: choker. Stringing: Double Knotted Fine Silk Thread The necklace is professionally hand knotted by double silk threads between each shell pearl. Material: shell pearl. shell Pearl Size:12mm. Main Colour: PINK. Style: choker. Main Colour: Chocolate. Stringing: Double Knotted Fine Silk Thread The necklace is professionally hand knotted by double silk threads between each shell pearl. Material: shell pearl. shell Pearl Size:8mm. New Fashion Long 8mm White round South Sea Shell Pearl Necklace 54"
Stringing: Double Knotted Fine Silk Thread The necklace is professionally hand knotted by double silk threads between each shell pearl. Material: shell pearl. shell Pearl Size:8mm. Style: string. Main Colour: white. 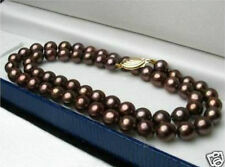 8-9MM Brown irregular freshwater pearl loose beads 14 "
Main Colour: coffee. Material: 100% nature pearl, Genuine pearls,not fake or shell pearls. Pearl Size:8-9mm. Style: loose beads. Stringing: Double Knotted Fine Silk Thread The necklace is professionally hand knotted by double silk threads between each pearl. Main Colour: fruit Green. Stringing: Double Knotted Fine Silk Thread The necklace is professionally hand knotted by double silk threads between each pearl. Material: 100% nature pearl, Genuine pearls,not fake or shell pearls. Stringing: Double Knotted Fine Silk Thread The necklace is professionally hand knotted by double silk threads between each pearl. Main Colour: Sky blue. Clasp: SILVER plated. Material: 100% nature pearl, Genuine pearls,not fake or shell pearls. PRETTY FRESHWATER PEARLS! PALE GREEN AND GREY..UNIQUE COLOURS..GREAT FOR SUMMER! GORGEOUS freshwater pearl necklace in colours of pale green and grey. Seem to be natural freshwater pearls with colour. Style: choker. Main Colour: multicolor. Material: 100% nature pearl, Genuine pearls,not fake or shell pearls. Stringing: Double Knotted Fine Silk Thread The necklace is professionally hand knotted by double silk threads between each pearl. Style: Choker. Stringing: Double Knotted Fine Silk Thread The necklace is professionally hand knotted by double silk threads between each pearl. Main Colour:Multi-Color. Main Stone: pearl. Material: 100% nature pearl, Genuine pearls,not fake or shell pearls. The necklace fastens with a fancy heart shaped slide clasp. A lovely necklace to go with a special outfit. The necklace fastens with a fancy round toggle clasp. A lovely necklace to go with a special outfit. Pearl Size: 7-8MM PEARL 12-14 SHELL PEARL. Main Colour: South Sea. Material: 100% nature pearl. Clasp: 18k GP. Q: I want to change another clasp, is it OK?. Q: Can I get my necklace or bracelet in a longer or shorter length?. This is a beautiful light blue South Sea pearl necklace with 8mm pearls and a push clasp. Main Colour: Army Green. Stringing: Double Knotted Fine Silk Thread The necklace is professionally hand knotted by double silk threads between each pearl. Clasp: SILVER plated. Material: 100% nature pearl, Genuine pearls,not fake or shell pearls. Style: choker. Stringing: Double Knotted Fine Silk Thread The necklace is professionally hand knotted by double silk threads between each pearl. Clasp:925 silver. Material: 100% nature pearl, Genuine pearls,not fake or shell pearls. Main Colour: Multicolor. Stringing: Double Knotted Fine Silk Thread The necklace is professionally hand knotted by double silk threads between each shell pearl. Material: shell pearl. shell Pearl Size:10mm. Stringing: Double Knotted Fine Silk Thread The necklace is professionally hand knotted by double silk threads between each shell pearl. Material: shell pearl. shell Pearl Size:8mm. Style: string. About Pearl.